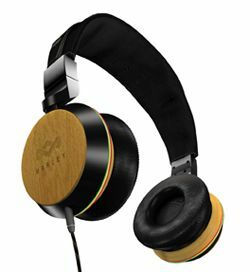 UPDATE: The House of Marley headphones head to the UK | What Hi-Fi? We first saw The House of Marley headphone range at CES back in January, and now comes news that they'll arrive in the UK this autumn. They'll be on sale in HMV stores, sports specialists and other leading retailers. There are three collections – Jammin', Freedom and Destiny – featuring noise-isolating in-ear and active noise-cancelling over-ear headphones. Docking stations and portable audio systems will follow in the UK soon afterwards. Retail prices for the headphones range from £20 to £250. "Our father shared his vision with our family and his fans through the gift of the messages in his music and it is our mission and responsibility to push the movement forward," says Bob Marley's daughter Cedella Marley. "The House of Marley and the Marley audio products that bear our family name were created to spread our father's music and vision to a new generation." * MARLEY Jammin’ Earbuds – Available in three varieties and including different colour options: Smile Jamaica (red, right), People Get Ready, and Midnight Ravers (green, top). * MARLEY Jammin’ Headphones – Available in two varieties with different colour options: Positive Vibration and Revolution. * MARLEY Freedom Earbuds – Available in three varieties and with colour options: Redemption Song IE, Conqueror and Zion. * MARLEY Freedom Headphones – Available in two varieties: Exodus and Stir It Up. The House of Marley has announced its first range of headphones in collaboration with US company HoMedics. The family of Bob Marley hopes The House of Marley will embody the late singer's 'values of equality, unity, authenticity, sustainability and charity'. Should he have also valued market saturation he would have been impressed by the sheer number of products set to be launched, with the Jammin', Freedom and Destiny ranges set to include headphones, iPod docks, speaker systems and more. The Jammin' earbuds come in a range of styles and colours, while the Jammin' Headphones offer a choice of in-ear and over-ear models, again in a choice of styles and colours. Next in line is the Top Rankin' speaker with an auxiliary input for connecting any audio source, while the Jammin' Roots Rock speakerbag brings music on the go - and in a bag, seemingly - to iPhones and iPods. If Jammin' has the youth market in its sights, the Freedom range points itself at those wanting something a little more serious in style and performance. Again, you'll find earbuds, headphones and an iPod dock in the Freedom range, including the Freedom Headphone Revolution Natty pictured above. Lastly – for now – is the Destiny range, which promises to deliver 'pro-level audio components'. To see more of the products, head over to our CES Unveiled blog from earlier in the week or The House of Marley website.